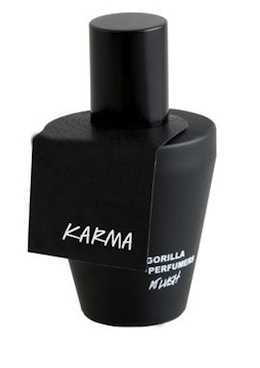 * Karma starts with a brash and intense blend of orange, bergamot, and pine. * One or two sprays is enough- any more and Karma transforms from strong fragrance to industrial cleaner smell. * When Karma starts to relax – the intense pine and orange mellow and are warmed up by an earthy patchouli and a slight touch of lavender. * Projection is massive for the first few hours of wear, everyone around you will hear your statement. * The base is much softer than you would imagine from the beginning – clean patchouli, sweet vanilla, and light musk. Summary: Karma is a love it or hate it fragrance – there seems to be no middle ground, which is odd because it is apparently inspired by hippies who are known to be a peace-loving, tranquil people. Then again – most people either love or hate hippies – so there ya go. I also loved reading that the scent was inspired by the “psychedelic 70s and Massive Attack’s layers and layers of creamy sound.” Since Massive Attack’s CD ‘Blue Lines’ is one of my all time favorites that made me want to like the fragrance even more. However, I just don’t see the correlation. Unless it’s an intense beat that overpowers you and subdues you to a trancelike warmth. Ok, I am trying too hard. A few caveats, the juice is really dark so be careful that it might stain clothing. This is a nighttime going-out scent – not at all office-friendly. Defintiely test this one a few times before buying, as it reacts to your chemistry and seems to amplify with your moods. The longevity is insane – more than 18 hours on my skin. I love it an bought a full bottle and I wouldn’t mind a candle in this scent. Karma (the fragrance) is available at Lush Stores and from the Lush Website. Image courtesy of Lush. No disclaimer needed as I own a full bottle. This is sooo not a me fragrance but hubs loves it. He’s been through 2 bottles already It is such a strong fragrance. He will wear it and I can smell him in the basement when I’m on the 2nd floor. No joke. I could see him wearing it.. and I knew you would either love it or hate it.. its one of those DIVISIVE scents. You strike me as more modern vintage than hippy. You’re back! Count me as a “hate it” as well on this one. But I do think the Lush bottles are kinda cute. Yes I am back I am going to be doing more reviews of my favorites before switching back to new/current releases. Lush has great bottles and price points. Some are absolutely amazing.. others are meh.. this one sings on me, but I have to be in the right mood for that.